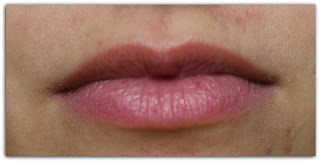 For this weeks Lip product Tuesday as promissed a swatch & review from the Glossybox lipstick in Glossy pink. I'm not sure if you can actually buy them or that you can only receive these with a subscribtion. However this lipstick is available in 30 different shades. I'm actually really curious to try out the other shades. I really like the application of this lipstick, it's also pretty long lasting if you ask me. What I dislike is that the formula of this lipstick is kind of mouth drying if you know what I mean. You probably don't so I'm going to explain it, just in case. Sometimes when I use a certain lipstick or lipbalm I get a really dry mouth. && for some reason that's because of the lipstick or lipbalm that I'm wearing. Because I only have it when I'm wearing it && drinking doesn't work. If you know what I mean please let me know because I feel really silly writing this, haha. This is a swatch of the gorgeous lipstick, the colour is really my thing. It's pretty natural with a hint of old pink. && my lips with the lipstick on.